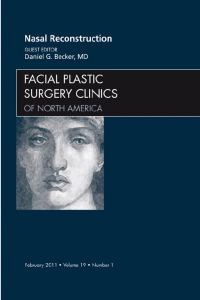 Dr. Menick’s article, Complex Nasal Reconstruction: A Case Study – Composite Defect provides a detailed analysis of a complex nasal, cheek, and lip defect and the approach to repair with a forehead flap and cheek flap. 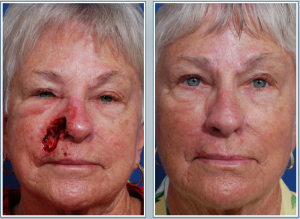 Preoperative, intraoperative, and postoperative photographs illustrate the surgical stages as the patient presents after Mohs excision to complete reconstruction. 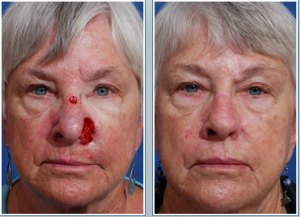 Some years before, this patient required a separate forehead flap reconstruction of the opposite side of her nose for an earlier skin cancer. Pre-and postoperative photographs of the defects and both nasal reconstructions are available in before and after photos on the website.